A network camera, often also called an IP camera, can be described as a camera and computer combined into one unit. It captures and sends live images directly over an IP network, enabling authorized users to locally or remotely view, store, and manage video over a standard IP-based network infrastructure. A network camera has its own IP address. It is connected to a network and has a built-in Web server, FTP server, FTP client, e-mail client, alarm management, program- mability, and much more. A network camera operates as an independent server on a network and can be placed wherever there is an IP network connection. In addition to video, a network camera also can support other functionalities such as audio, alarm activation via digital inputs and outputs, and serial communications. A video server makes it possible to integrate an analog camera into a network video system without having to discard existing analog equipment. 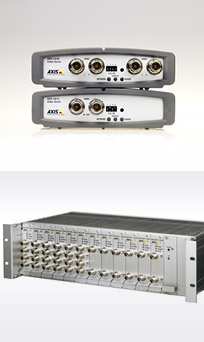 A video server digitizes analog video signals and distributes digital images directly over an IP-based network (e.g. LAN/intranet/Internet), turning analog cameras into network cameras. It brings new functionalities to analog equipment and eliminates the need for dedicated equipment such as coaxial cabling, analog monitors and DVRs — the latter becoming unnecessary as video recording can be done using standard PC servers. A video server typically has between one and four analog ports for analog cameras to plug into, as well as an Ethernet port for connection to a network. Like network cameras, a video encoder contains a built-in Web server, a compression chip, and an operating system so that incoming analog feeds can be converted into digital video, sent, and recorded over a computer network for easier accessibility and viewing. In addition to the video input, a video encoder can also support other functionalities such as audio, alarm activation via digital inputs and outputs, and the control of PTZ (pan, tilt, zoom) mechanisms through serial ports. A video encoder also can be connected to a wide variety of specialized cameras, such as a highly sensitive thermal camera, a miniature camera, or a microscope camera.